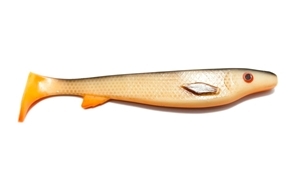 Fatnose Shad from Edvin Johansson is a new rubber lure for pike. With its high profile and smaller body it has a really seducing action in slow speeds. This product will #cashback 3 fishcoins when recycled! Edvin Johansson, member of Team Galant and also known from "Fishing with Edvin and Philip", is a young angler and lure builder with a big passion for pike fishing. The Fatnose Shad has a high profile and a small body which gives it a really seducing movement in slow speeds. These characteristics also makes the lure more easily spotted and lures the pike upp from the depths. Fatnose Shad is a follow up to the popular Flatnose Shad. Just like its little brother, The Fatnose Shad can be rigged in many different ways to fit your fishing situation perfectly - for the shallow fishing you can just simply rig it on a Shallow Screw and a BFT Shallow Stinger - Stainless Steel. For fishing in deeper waters we recommend a BFT Flexhead Pike jighead with a weight that fits the depth you want to fish at, the deeper the heavier jighead. Don't forget to try and insert a Bauer Power Rattle in the paddle, this way you'll have all the odds on your side. 23 cm long and weighs 60 gr.